The Ganges River can surprise you, and I mean in a good way. High in the Himalayan foothills you can play on its aquamarine waters and sleep on its snow-white sand banks. I wasn’t always a luxury spa freak. I’ve always liked adventure travel and exotic places, as long as there’s some hygiene and comfort involved; I like simplicity but I draw the line at grunge. Some of the most frou-frou people I know can roll up their trouser legs and hike up a mountain in the Himalayas without showering or shampooing for days. I can’t say I’ve done that yet, but I like white water rafting and have done it in the US, Bali and India. So far my favourite rafting trip was in the Indian Himalayas (which is where one does it if one is doing it there) and I loved this beautiful destination. The place to go white water rafting in India is on the Ganges River in Rishikesh, which enjoys dual fame as the center for both yoga and white water rafting in India. Sounds like an unlikely combination but when you see the stunning landscapes here, it makes perfect sense as a place to connect to nature, whether you’re on an inner or outer journey. Think of the Ganges River and you’ll usually picture the wide, flat, murky expanse of river at the holy city of Varanasi where the bank is lined with bathing Ghats (steps), crematoriums, and funeral pyres, along with the seething mass of humanity bathing in the holy waters. It’s frightening to see what’s floating around in these dark, dingy, waters – decomposing carcasses of dead cows or the sad remains of other unfortunate creatures that didn’t quite make it to the funeral pyres. The water must be teeming with microbes. Yet somehow thousands of people immerse themselves and drink this water and manage to emerge without catching a life-threatening virus or brain-eating bacteria. But the Ganges has more dimensions to it than that. What many don’t realize is that this massive river has its source high up in the frosty Himalayas and is a completely different river up in northern India near its source. This region is seven hours’ drive north of Delhi in the state of Uttarakandh, which lies along the border of Nepal and Tibet. It’s an area of stepped green hills framed by the snow-caps of the Himalayas where lush, idyllic valleys dip between the hills, dark blue lakes reflect the surrounding ring of mountains, and deep river gorges curve through hill and rock. Pastel coloured hamlets, clusters of simple cubes resembling children’s dollhouses, perch precariously on the steep hillsides. The local villagers are visible as brilliant flashes of pink, yellow and red, their vividly coloured saris weaving through emerald green fields of wheat and beets, or among the pine covered slopes collecting leaves to feed their cattle. They go about their daily tasks just as their ancestors have done for centuries. As tourist destinations go, this region is probably best known for the British colonial hill stations Nainital and Mussoorie, once summer retreats where the British Raj sought the cool mountain air to escape the sweltering heat of the plains. But its star attractions are the stunning, unspoilt scenery and trekking routes that are well off the beaten track and untrammelled by the tourist hordes you’ll find in other parts of Asia. This hill region is where the holy Ganges River emerges from its source at Gangotri, not far from the Tibetan border, before gushing southward on its long and ever expanding journey to the sea. Along the winding mountain road it’s common to see Hindus making the ritual pilgrimage walk between the four holy Himalayan pilgrimage destinations, Gangotri, Badrinath, Kedarnath and Yamunotri, collectively known as Char Dham. Other popular pilgrimage centers along the river route are the towns of Rishikesh and Haridwar, where the Ganges leaves the Himalayas and enters the plains. The pilgrimage site at Gangotri, the source of the Ganges in the Himalayas. Looks like a scene from The Mummy but this is real life. The shrine at Kedarnath along the Char Dham pilgrimage route. 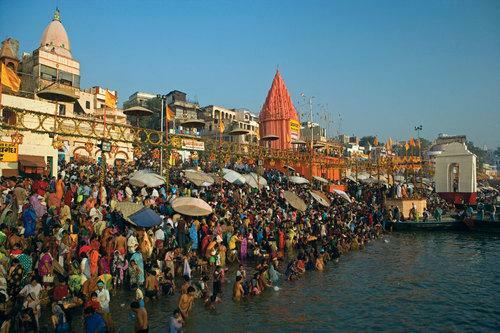 This is one of the holiest areas in India, where alcohol consumption and meat eating are forbidden, temples and ashrams abound along the river bank and fishing in the Ganges is prohibited. The trout are large and plentiful. Wild animals roam freely in their natural environment. I’m a city girl, not accustomed to sleeping outdoors or hiking for miles in the mountains, so I’d approached the idea of sleeping in a tent in India with some caution. “Will I have to pee in the bushes at night?” I’d asked my friend who organized the trip, who’d told me not to worry and bring a flashlight. I went and bought a Maglite which is the perfect camping flashlight and converts into a bedside lamp when you want to read in your cot. Actually, it wasn’t the bushes that made me nervous; it was the thought of being bitten on the bum by a cobra that scared the hell out of me. There are plenty of snakes in India, most of them poisonous. This is the land of snake charmers, after all. But my fears were allayed the moment I set eyes on our tent at the Snow Leopard Camp near Rishikesh. The camp is one of a few permanent tented camps lining the powder-white, sand-duned river banks. Our tent, like the others, was set up to house two people. I entered the flapped entrance to find a carpeted floor, twin beds covered with fluffy duvets, a night table equipped with a mirror, clean white towels and shampoo and shower gel in plastic bottles branded with the camp logo – a placid Snow Leopard relaxing on its stomach. As a final touch (and to me the most pleasing aspect), the entire tent and its furnishings, along with everything else in the camp including the plates, cups, and the staff’s uniforms, was completely colour-coordinated in white, olive green and khaki. Not only was it charming and cozy, but that night when a log fire and armchairs materialised in front of our tent and curry-laden plates and steaming tea appeared out of the darkness, it also became my favourite campsite. Can you believe this is the Ganges River? 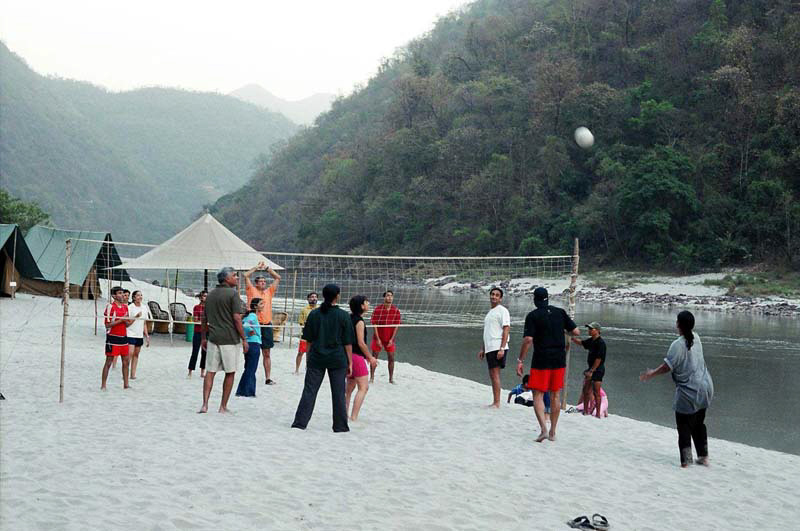 The 40 km stretch of Ganges around the pilgrimage town of Rishikesh is known as the white water rafting center of India. The river here is an especially scenic stretch of river gorge, interspersed with rapids ranging in force from class 2 to class 4. Tented camps line the beaches, the biggest and better ones being Snow Leopard, Himalayan River Runners and Aqua Terra. Looks like snow, but no, it’s snow white sand, and is powdery soft. Our professional rafting guide, 25-year-old Brit Chris, had sun-freckled skin, sun bleached hair and a well cut torso from years of kayaking. Chris had been a rafting guide on the Zambezi River in Zaire before coming to India, and was one of the surprisingly many Europeans who were imported by local rafting companies, ensuring that stringent international safety standards are maintained, as well as the training of local staff. White water rafting was a popular activity among middle-class urbanites from Delhi and Bombay, corporate groups and upmarket foreigner travellers. Since it was on the pricey side, it wasn’t exactly a backpacker activity. Our first day on the river, we found ourselves the lone foreigners in the midst of a Delhi PR firm’s corporate outing. This group of frenzied yuppies, let loose from their urban routines, were intent on fun and splashed down the river with water fights galore and frantic laughter. At one point our caravan of rafts regrouped in the middle of the river and our three dozen giddy Indian companions burst into a joyful, repetitious Hindi song. We were trapped in a Bollywood movie! The water was so cold that whenever we stopped paddling to rest, I shivered uncontrollably. When I pulled a tube of lip balm out of my pocket to try to soothe my horribly cracked lips, my hands were shaking so hard, I could barely hold the tube, on top of laughing hysterically at my own ineptitude. The others in the raft watched in glee as my shaky hand smeared lip balm all over my face, everywhere except on my lips. My friend was doubled over in laughter and so was I. How come nobody else in the raft was a quivering jelly like me? (I still laugh when I think about it now). The next day the corporate group left leaving only two of us left in the camp. Chris took us rafting on a different stretch further up the river, bringing his kayak with us. When we were comfortably settled into the raft and into our rhythm, he got out and kayaked alongside us as we bobbed down the river. We watched him whirl and twirl and roll expertly along the waters, with amazing skill and speed. It was like watching a dancer who’s in complete control of his body. When it was time to head back to camp, all we had to do was let the current carry us down stream until we reached our beach. Chris said we could jump out and swim, though we didn’t have to do much since our life jackets and the current carried us down the river. At first we shrieked our heads off from the glacial water that came straight from the Himalayas, but then we were shrieking with excitement. It was exhilarating. We got back to our beach with hot mugs of spiced masala chai waiting for us. We passed people meditating on the riverbank. They were from the many ashrams around Rishikesh. “Tomorrow I’ll take you to feed the piranhas,” Chris told me when he handed me a mug of steaming spiced masala tea as I stepped out of the ice-cold river before the sun set behind the hills. He looked dead serious as I gazed nervously back into the luminous green river where we’d just spent the entire day white water rafting, kayaking and swimming, then broke into a laugh when I realised I’d been taken in. Of course there aren’t any piranhas in the Ganges River. There were plenty of wild animals in the surrounding hills though. Good morning world! We could see all the way to the opposite bank from our cots. Next morning we woke up to the camp staff bringing us “bed tea” on a tray to our tent. In India, “bed tea” is what they call morning tea delivered to your room before breakfast. We drank our tea lying in our cots watching the sun shift on the river through the open tent flap. The air was slightly chilly and super fresh, and we snuggled under our cozy duvets. View from Snow Leopard Camp. Can you believe this is the Ganges River? The river glowed a luminous, aquamarine green. On the opposite bank, we could clearly see several monkeys and a few deer coming to drink water from the river. Everything was beautiful. Have you been white water rafting in Asia? Where are your favourite places to raft? I love this! A dream trip for me! Hi Jane! It’s so gorgeous in this region, especially the scenery around Garhwal, near Rishikesh. I would love to go back there again if I have the chance.